If you were going to give up something, one thing, to immediately improve your health, what would it be? I finally gave up soda, or as I like to call it, pop, and I can't believe it took me almost 28 years. What was I thinking drinking this, deliciously sweet and beautifully marketed, beverage poison? 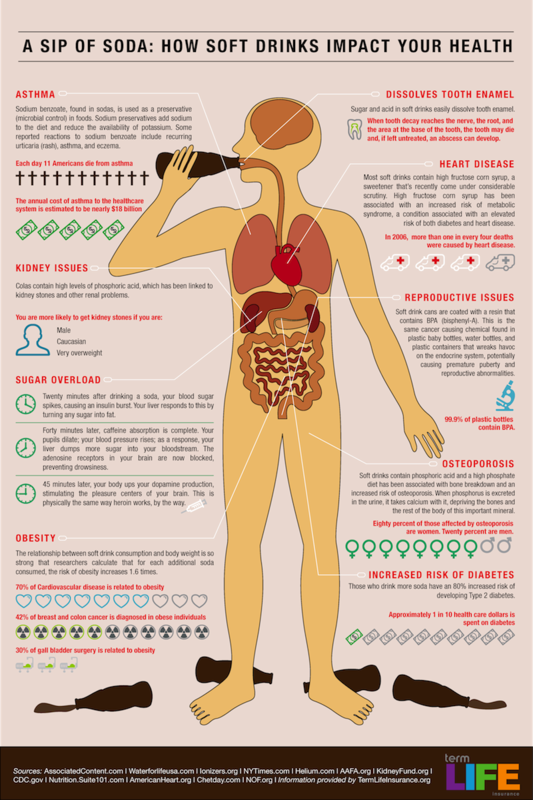 Phosphoric Acid in soda weakens bones and eats through enamel to rot your teeth. The caramel color added to soda is made of chemicals, does nothing for the flavor, and is purely for cosmetic purposes. Oh, it's also full of carcinogens. High fructose Corn Syrup- is a concentrated form of sugar. Fructose is derived from corn. It increases body fat, cholesterol, and triglycerides in your blood. It also increases hunger. For those of you (me) who drink (drank) diet soda- Aspartame and excessive artificial sweeteners are addictive and make you crave more "sweets". Believe it or not, formaldehyde is in your soda. It is a carcinogen and not added directly, but when you digest aspartame, it breaks down into 2 amino acids + methanol = formic acid + formaldehyde... yum = diet soda! Potassium Benzoate is a preservative. It breaks down to benzene in your body. When your soda is in contact with the sun + benzene = carcinogen! Food dyes can lead to impaired brain function, hyperactive behavior, difficulty focusing, and lack of impulse control. Maybe our children's behavior has more to do with what they are putting into their bodies, and less to do with ADHD!